One of the defining characteristics of money in relatively modern societies is that it is accepted as such by banks. (Ancient societies had a somewhat more informal notion of banking.) Although there could be other instruments used for transaction purposes, if they are not accepted by banks, their usage will be limited. 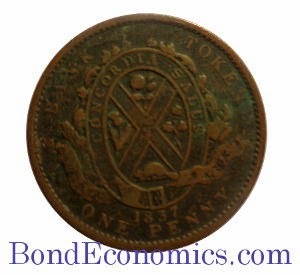 Acceptability by banks drove the usage of copper tokens in the Canadian colonies. This article is a somewhat tangential reply to some comments of Eric Lonergan on the previous "Money As Debt". Although I was raised in a patriotic pro-Empire immigrant family, it is safe to say that the British colonial administrators did not always take into account in the interests of the colonists. In the case of the Canadian colonies, one of the ways that this showed up was in a lack of circulating coinage. Since the authorities did not supply coins, the private sector stepped in an copper tokens were used as money. It should be noted that these tokens were for small denomination purchases; large transactions would be in the domain of the banking system. The Canadian banking system has attracted interest from the libertarian "Free Banking" school (which believes that banking should largely not be regulated). There was no central bank within Canada; if any entity filled that role, it would have been the Bank of England. I am not familiar enough with the literature to comment on how banks operated. The coinage situation varied across the colonies. However, in Lower Canada, the situation was generally quite ugly after the Ordinance of 1764 which forbade the usage of old Spanish dollars (which had been cut into pieces). 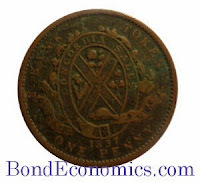 In 1812, foreign tokens were imported, and then locally produced tokens started circulating. By 1837, anything the size of a halfpenny would pass for a token and the banks, in the absence of action by the government, refused to take any of the so-called copper currency except by weight and issued their own tokens. Broadly speaking, the average person on the street is quite easy-going with respect to the acceptance of coins. As long as other people accept it in commerce, there is little concern about the actual metal content behind them. This was not a peculiarly Canadian characteristic; the same is true of other countries that operated with coinage that was clipped or debased. As noted in the Tweet above by Eric Tymoigne, monarchs "cried down" their currency periodically. As a result, the belief that money is accepted solely based upon the utility value of the metal behind it is debatable. However, this acceptance of the underweight tokens ended once the banks stopped taking them in. I am hardly an expert on that period of history, but breaking the linkage between the nominal value of the token and the nominal value of bank accounts was enough to drive them out of circulation. I don't know if this is a legal right/obligation to US citizens (or all holders of dollars) [to convert currency into reserves - BR] - but no one uses or holds them for this purpose. If in doubt, ask them. It is also not a right, that I am aware of - or care about - for any other currency which I (or anyone else) uses. Now, the holders of debt specifically do so to receive income and repayment of principal. I accept that the role of "money" can be thought of as different than the role of "debt"; however, it seems that (modern) money almost invariably takes the form of debt instruments. Although it is clear that most people would not view dollar bills as being equivalent to reserves, they certainly do equate them to the dollars in bank accounts. As my token money example shows, non-acceptance by banks dooms something from being considered "money." Furthermore, banks are quite well aware of the equivalence between reserves and currency notes. The role of the banking system driving money cannot be overlooked. The banking system operates with a unit of account (for example, the dollar), and there is an expectation that "money" will be accepted at par as a deposit. Given that adults generally have bills and debts denominated in that unit of account, it is difficult to use other potential means of exchange. Meanwhile. it is difficult to see what banks would exchange at par value other than debt instruments. For example, one could imagine that trades could be denominated in livestock (which happened in many societies). However, you are not going to get too far attempting to deposit a hog into your savings account in a bank branch in downtown Toronto. My token example appears to undercut the claim that money generally consists of debt instruments. Are they not based on weights of copper? Firstly, it should be noted that tokens were used for small denomination transactions. Nobody would buy a house using a sack of tokens. Large transactions occurred within the banking system, which is debt-based. Secondly, many tokens could be thought of as a form of debt. The issuing entity was often inscribed onto the token. Even if the token was underweight, the issuer would be expected to accept the token back at face value. Although you and your customers know your penny token is mainly brass, you have to accept it exchange for goods worth a penny. The token can be viewed as a collateralised IOU; the metal content of the coin serves as collateral. People will accept collateral below the face value of the IOU if your credit is good. Anonymous tokens did circulate. These cannot be traced back to any issuer, and so do not appear to be debts. However, their circulation was presumably aided by the credibility of the people using the coins. I am not an expert on the social customs of the nineteenth century, but it strikes me that one would not call into question the validity of a token handed to you by an honourable gentleman. In other words, the acceptability of the token in commerce was based on the credit of the users. Can I give you an example to mull? The example: A store displays a sign behind the counter that says "Change may be U.S. Coinage or Store Tokens. All Store Tokens will be exchanged for merchandise." After posting this sign, the store begins distributing most change in Store Tokens. Are these Store Tokens debt or money? My answer: The tokens are money upon acceptance as change by the customer. The tokens are also evidence-of-debt because the issuing store has promised to exchange the tokens for merchandise. The tokens are not "debt" because there is no time period, no interest payments, and no reoccurring performance requirements placed on the issuer. This supports my contention that money (especially fiat money) can be considered as being evidence-of-debt. I am unsure what you mean by "evidence of debt". Therefore the token is certainly a liability, and speaking loosely, a debt. I am unconcerned about how other people define "debt", I am looking at the situation like a financial engineer. A "bond" is a well-defined generic financial instrument, and can take many forms, including zero coupon, perpetual, etc. This is a generic definition, such as you would find in a finance textbook, and does not coincide with how securities laws defines "bonds". I then define a "debt" as an instrument that is economically equivalent to a bond. Most liabilities that can be considered an instrument ends up being a "debt" by this definition. Note that "bearer bonds" are redeemed by the holder, and this redemption can presumably be after the notional maturity date of the bearer bond. Anything that is payable on demand, like a token, falls under this definition. That is - there is a notional maturity, always equal to "today" or an arbitrary date in the past (with no interest accruing after the maturity date). "I am unsure what you mean by "evidence of debt"." Think from the perspective of an investigator. An investigator notices that an individual begins with no money in a bank account and later does have money in a bank account. How did that money arrive? The individual could have worked to earn money, could have sold resources, or could have borrowed. Neither work nor selling resources could actually create initial money. Borrowing from banks is accepted as a way to increase money on deposit in private accounts. If working and selling resources cannot create money, the only candidate left (to explain the existence of money in a bank account) is that debt (from bank borrowing) has been incurred sometime in the past. Thus we see that money is "evidence-of-debt". If the Treasury mails you a cheque, you will also get an increase in your bank account (but the Treaury will have a reduced balance at the central bank). Brian - I don't seem to be getting the thrust of your comment. Are you suggesting that the central bank has money that is unrelated to debt? I think that loans (or purchases of debt) by the central bank are always exchanges of money for debt. The debate between Wray and Lonergan is whether monetary instruments are debt, not how they are created. If money are debt instruments, they are obviously related to debt. The creation of money can be done without explicit lending (although one could argue that reserve creation is implicit borrowing). A private bank can create deposits by making a payment to a depositor; there is no explicit loan (other than the increase in the deposit, which is a form of debt). It strikes me as foolish to argue the composition of something you can hold in your hand (or in your bank account) if you do not exactly know how it has been created. You should also know how it can be destroyed (beyond the obvious fire or by-hand-destruction). We also need to recognize that private individuals can create money (it is called counterfeiting). Of course government can lend to itself (central bank to treasury). Government could create electronic deposits or print currency without recording the event. That action would be financial catastrophe. "Now, the holders of debt specifically do so to receive income and repayment of principal. " No they don't. They hold debt as an asset. It may have a repayment of principal or it may not. It may receive an income or it may not. Lonergan wants a specific definition of the word 'debt' - one of owing money according to very narrow terms. But debt is wider than that in society. "I am in your debt" for example. Debt just means something owed. It doesn't say what. It doesn't say when. It is just a promise of some kind. Whatever kind. Again being British this is never a problem, because all my money has written on it in ink: "I promise to pay the bearer on demand the sum of X pounds". A debt is just a promise in the wider sense of the word. Why are we bothering arguing with somebody over definitions. This is worse than the word 'inflation'. debt comes from the Latin "debitum" - something owed. If Lonergan thinks his narrow definition has some use, then let him come up with a new word for it. I was looking at my American money, as I believe that they used to have a similar inscription, but I guess it has been removed from more recent bills. This comment reminded me to dig up one of my old pound notes. Brian - excellent post. I read you as being very cognisant of the difference between money and debt, while you rightly point out that we have typically used debt instruments as money. That is true - they are highly convenient and have value independent of the network externality, assuming the issuer is credit-worthy. It would be interesting to know if bills of exchange etc, when used as money, traded at premia to face value in the same way as gold coins did. As regards the banking system - it is of course far more convenient to net off transactions and settle the difference using "money" - i.e. banks reserves, which are not a liability in any meaningful sense. That is why our monetary system is based around credits and debits. As regards Neil Wilson - he completely misses the point. Debts are more than promises - they are promises to pay something. This is not mere definition - it is extremely important whether or not you owe something. Greece can issue debts, but it cannot create banks reserves - that is the whole problem! To spell it out: because bills are debts, the market requires a high interest rate from Greece on its bills. Reserves carry no obligation to pay anything (therefore are not a debt), but they are the means of payment (money), so if Greece could create money, instead of debt, its depression would end. The false treatment of reserves as a liability is also one of the justifications of austerity - QE exchanges bank reserves for government bonds. Because bank reserves are not really liabilities, this is a reduction in the government's net debt. So, there was no significant increase in, for example, the UK's net public debt after the financial crisis. But if bank reserves are genuine liabilities at book value - Mervyn King and Osborne had a point. I argue that there is a contingent liability associated with bank reserves (i.e. you may have to issue debt in the future to reduced the stock of reserves), but this was never significant after a financial crisis. http://blogs.ft.com/economistsforum/2012/06/governments-can-borrow-without-increasing-their-debt/ It is in fact much more defendable to say that government debt is not a simple liability, which is one of Minsky's profound insights, and in fact where Randall Wray ends up going. What is odd is the dogmatic, blinkered, denial of the independent existence of money - which I expect to hear more of from Neil! Just one point. There are two types of reserves - required and excess. The central bank has to pay interest on excess reserves, as otherwise Treasury bill yields will go to something that is near zero. In a zero rate environment, the government does not need to pay interest on anything, so reserves are not that special. As for required reserves, the central bank can get away with not paying interest. This is effectively a tax on banks, and reserve requirements were actually abolished in many developed countries (the US being the main exception). Even for countries that keep reserve requirements, QE does not create required reserves, only excess reserves, as there is no reason to expect that bank lending will rise at a pace that matches reserve creation. There may be some small advantages of QE for reducing interest costs, but if you look at a simplified model of government finances, the introduction of QE makes no difference for the dynamics of government liabilities -- liabilities compound at the short-term interest rate. Notice that the central banks are not required to have "reserves". Only private (meaning not-government-owned) banks have a reserve requirement. This availability of unlimited reserves gives the central bank the ability to loan without limit. Roger - nice way of putting it. Brian - QE is a reduction in the net debt of the government. The payment of "interest" on reserves - required, or 'excess' - is voluntary, hence not really "interest". We have seen this with the BoJ's action. The BoJ has actually moved the government yield curve while making a transfer payment to the banks on (all current) reserves. It's voluntary in the sense that the central bank is forced into a policy of permanent ZIRP. That would cause the heads of most central bankers to explode. If you want to use interest rates as a policy variable, you have to pay interest on excess reserves. Thhe government can increase the amount of required reserves, and thus reduce the amount of interest it has to pay. But that's just a tax on the banks. The government could just as easily impose a special tax on banks to cover its interest expense, and achieve exactly the same effect. This is only a superficial relabelling of a policy that has the exact same effect as another possible policy - which has obvious defects. I mean that it is voluntary to draw a contrast with the issuance of debt. If an issuer sells debt into the market, it cannot choose the interest rate to pay. This is a price set by the market. However, the CB can just create reserves (money), and then voluntarily tax or reward. Your distinction between what is a tax, transfer or interest rate when discussing reserves, looks totally arbitrary to me. It also appears arbitrary in practice - look at what the BoJ has just done: it is in fact using three "interest rates" - one on existing reserves, one on required reserves, and one on new reserves. The reality is that the BoJ is making a transfer to banks on existing reserves - this has nothing to do with the determination of market interest rates.